Over 14 million Americans use propane, because it is such a versatile source of energy. Propane can power your heat and hot water, cooking stove, fireplace, pool and much more. 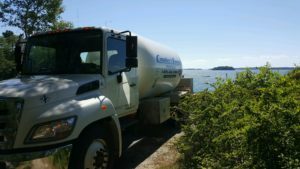 We are pleased to provide both will-call and automatic propane delivery as well as expert, safe propane tank installation. Propane is cheaper than electric. According to the U.S. Department of Energy, heating a home in the U.S. with propane in recent years has cost far less than heating with electricity – at times, two-and-a-half times less! In addition, over time, propane water heaters can cost one-third less to operate and recover water twice as quickly as electric water heaters. Propane is warmer than electric. A propane gas furnace heats air to about 130°F to 140°F and operates in short intervals to minimize operating costs. An electric heat pump produces heat below body temperature (98.6°F), so the air actually feels cool when placing your hand in front of a vent. Propane furnaces last longer than electric heat pumps. Propane-fueled furnaces last 5 to 10 years longer than electric heat pumps, on average. Propane is more dependable than electric. Propane can be stored safely in a tank on your property, while electricity is subject to power outages. Reliable propane works when and where other energy sources don’t. Propane is clean. By using this exceptional energy, homeowners can help cut emissions and protect the environment. Propane is an approved alternative fuel listed in both the Clean Air Act of 1990 and the National Energy Policy Act of 1992. Moreover, propane is nontoxic and insoluble in water. Because it is released as a gas, it doesn’t spill, pool, or leave a residue. Propane is safe. Propane has quite a remarkable safety record, due in large part to the stringent codes and regulations developed by the propane industry and the National Fire Protection Association (NFPA). Propane also has built-in safety properties: it won’t ignite when combined with air unless the source of ignition reaches 940°F. Propane gas is nontoxic and produces minimal emissions, and is not harmful to soil or water. Propane is customer-friendly. With propane, you receive personalized “I’ll-be-right-over” service from Crowley Energy. You’ll never be treated like a number. 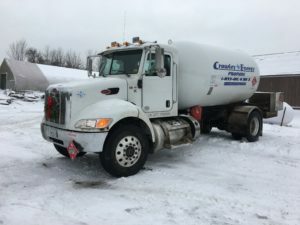 Need more information on our propane delivery? Contact us.